UCSF researchers generated thymus cells (TEPs) from human embryonic stem cells (hESCs). 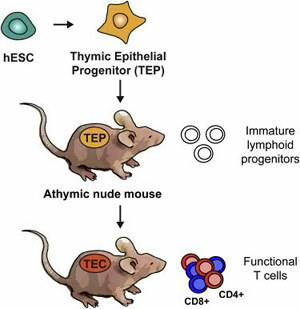 When transplanted into a type of mouse lacking a thymus or functional immune system, these cells further mature into thymic cells (TECs) that support the development of white blood cells that proliferate, retrain the immune system and carry out immune responses. The achievement raises hope that thymus tissue might be used to prevent transplant rejection and to treat immunodeficiency diseases. In a newly published study, scientists from UC San Francisco detail how they developed the first functioning human thymus tissue from embryonic stem cells in the laboratory, a significant step toward potential new treatments based on stem-cell and organ transplantation. Raising hopes for cell-based therapies, UC San Francisco researchers have created the first functioning human thymus tissue from embryonic stem cells in the laboratory. The researchers showed that, in mice, the tissue can be used to foster the development of white blood cells the body needs to mount healthy immune responses and to prevent harmful autoimmune reactions. The scientists who developed the thymus cells — which caused the proliferation and maturation of functioning immune cells when transplanted — said the achievement marks a significant step toward potential new treatments based on stem-cell and organ transplantation, as well as new therapies for type-1 diabetes and other autoimmune diseases, and for immunodeficiency diseases. Starting with human embryonic stem cells, UCSF researchers led by Mark Anderson, MD, PhD, an immunologist, and Matthias Hebrok, PhD, a stem-cell researcher and the director of the UCSF Diabetes Center, used a unique combination of growth factors to shape the developmental trajectory of the cells, and eventually hit upon a formula that yielded functional thymus tissue. The result, reported in the May 16, 2013 online edition of the journal Cell Stem Cell, is functioning tissue that nurtures the growth and development of the white blood cells known as T cells. T cells are a central immune cell population that responds to specific disease pathogens and also prevents the immune system from attacking the body’s own tissues. The thymus might be a bit obscure to the layperson — it’s a small gland at the top of the chest beneath the breastbone — but it is in no way expendable, as individuals with defective thymus function succumb to infection early in life. Given the invasive nature of cell therapy, which remains completely experimental, the first treatments using laboratory-derived thymus tissue would likely be studied in patients with fatal diseases for which there are no effective treatments, Anderson said. For example, one early treatment might be for the genetic disease DeGeorge syndrome, in which some newborns are born without a thymus gland and die in infancy. However, a potentially greater impact may be in the area of tissue transplantation, a goal of the emerging field of stem-cell-based therapies. Stem-cell-based therapies now are limited by the potential for the immune system to reject transplanted stem cells, Anderson said. For transplantation, stem cells might be coaxed down two developmental pathways simultaneously, to form both thymus tissue and a replacement organ. Transplantation of both might overcome the rejection barrier without the need for harmful immunosuppression, according to Anderson. “The thymus is an environment in which T cells mature, and where they also are instructed on the difference between self and non-self,” Anderson said. Some T cells are prepared by the thymus to attack foreign invaders — including transplants, while T cells that would attack our own tissues normally are eliminated in the thymus. In the same vein, thymus tissue might one day be used to retrain the immune system in autoimmune diseases, in which the immune system abnormally attacks “self,” thereby enhancing recognition and protecting from immune destruction. Researchers have discovered many of the proteins and growth factors that are switched on during the course of embryonic development and that are crucial to organ formation. Hebrok has spent years trying to develop insulin-secreting beta cells, a part of the pancreas that is destroyed during the course of diabetes. The sequential appearance of specific marker proteins within cells as they develop into the distinct organs of the gastrointestinal tract serves as a series of milestones, which has helped orient Hebrok and others as they seek to guide the formation of distinct tissues. Hebrok likens the quest for organ specific cells, including thymus cells and the elusive pancreatic beta cell, to an adventurous road trip. The pancreas and the thymus branch off the gastrointestinal tract in different places, but they share certain developmental markers. The researchers caution that they have not perfectly replicated the thymus, and that only about 15 percent of cells are successfully directed to become thymus tissue with the protocol used in the study. Additional study authors include UCSF Diabetes Center postdoctoral fellows Audrey Parent, PhD, Holger Russ, PhD; and graduate students Imran Khan, Taylor LaFlam, and Todd Metzger. The research was funded by the California Institute for Regenerative Medicine and by the National Institutes of Health. Mark Anderson is the Robert B. Friend and Michelle M. Friend Professor in Diabetes Research at UCSF, and Matthias Hebrok is the Hurlbut-Johnson Distinguished Professor in Diabetes Research. Hebrok and Anderson have founded a company, ThyGen Inc., to advance the discoveries described in Cell Stem Cell. 2 Comments on "Researchers Generate Immune Responses from Stem Cell Grown Thymus Tissue"
Thymus on the back of the heart is the foundation of formation of T-cells which produce immunity to the grown up. As the infant grows the Thymus also sizes down since its production of T-Cells function is over by then and moreover the risk of T-Cells attacking its own cells will be eliminated. The culture of Thymus cells is a good attempt to provide alternate therapy to autoimmune diseases the world over. Thank Yoy.